The following commands show you how to validate an XML file against a DTD or XSD using xmllint. The --noout option suppresses the output of the xml file. If you have a large file and want to break it into smaller pieces, you can use the Unix split command. You can tell it what the prefix of each split file should be and it will then append an alphabet (or number) to the end of each name. In the example below, I split a file containing 100,000 lines. I instruct split to use numeric suffixes (-d), put 10,000 lines in each split file (-l 10000) and use suffixes of length 3 (-a 3). As a result, ten split files are created, each with 10,000 lines. $ split -d -l 10000 -a 3 hugefile hugefile.split. In my previous post, I wrote about how awesome tmux is for managing multiple terminals. However, even though it is widely used, I haven't been able to find a good Bash completion script for it. The tmux package does come with bash_completion_tmux.sh but this does not complete command options or command aliases. So I wrote a better version which completes tmux commands, aliases and their options. However, there is still room for improvement. It would be nice if it could complete session and window names too, but I haven't found the time to implement this yet. My completion script is shown below. You need to source it in your Bash profile. Alternatively, save it to your Bash completion directory e.g. ~/.bash/.bash/.bash_completion.d and it should automatically get picked up. The script is also available in my GitHub dotfiles repository. If you can improve it, fork it and send me a pull request! I've started using tmux, which is a "terminal multiplexer", similar to screen. 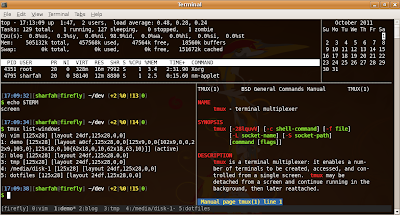 It allows you to manage a number of terminals from a single screen. So, for example, instead of having 5 PuTTY windows cluttering up your desktop, you now have only one window, containing 5 terminals. If you close this window, you can simply open a new one and "attach" to your running tmux session, to get all your terminals back at the same state you left them in. There are lots of cool things you can do with tmux. For example, you can split a terminal window horizontally or vertically into "panes". This allows you to look at files side by side, or simply watch a process in one pane while you do something else in another. The status bar along the bottom shows that I have 5 terminal windows open. I am currently in the one labelled "1-demo" and within this window I have 4 panes, each running a different command. There are quite a few key bindings to learn, but once you have mastered them you will be able to jump back and forth between windows, move them around and kill them without lifting your hands off the keyboard. You can also set your own key bindings for things you do frequently. For example, my Ctrl-b / binding splits my window vertically and opens up a specified man page on the right. My Ctrl+b S binding allows me to SSH to a server in a new window. Here is my tmux configuration taken from ~/.tmux.conf which shows my key bindings and colour setup. You can download this file from my GitHub dotfiles repository. bind R source-file ~/.tmux.conf \; display-message "tmux.conf reloaded!" bind / command-prompt -p "man" "split-window -h 'man %%'"
bind S command-prompt -p "ssh" "new-window -n %1 'exec ssh %1'"
bind h split-window -h  "man tmux"